Sheryl Staub-French received her BS degree in Civil Engineering from Santa Clara University and MEng and PhD degrees from Stanford University. She is an Associate Professor in the Department of Civil Engineering at the University of British Columbia, Vancouver, BC, Canada, where she is Director of the BIM Topics lab. She was the Coordinator of the faculty-wide Engineering Management program from 2002-2011 and held the Marshall Bauder Professorship in Engineering Economics from 2006-2008. She is a registered Professional Engineer, and a member of ASCE and CSCE. Dr. Staub-French is also the inaugural holder of the Goldcorp Professorship for Women in Engineering at UBC and Director of the eng•cite program, which develops and delivers a targeted recruitment strategy for UBC Engineering that aims to increase the number of women enrolled in its programs to 50% by 2020. eng•cite works with teachers, counselors, parents and high school students to promote engineering education, and provide mentorship and role models for young women who might not otherwise consider or pursue engineering careers. Dr. Staub-French’s research is focused on understanding and improving best practices for the delivery of sustainable building construction projects through effective and collaborative use of building information modeling (BIM). BIM involves a new approach to project delivery that focuses on developing a digital, information-rich model of a facility, allowing design and work planning to be coordinated virtually prior to constructing the actual physical buildings on site. Dr. Staub-French’s research has provided major contributions to this industry shift by developing new tools, techniques, and knowledge about how to represent, coordinate, share, and use BIM data. 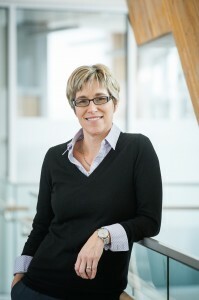 Her work requires a collaborative approach, involving partners from a variety of disciplines spanning architecture, community planning and computer science as well as significant involvement from industry. This research was facilitated by two multidisciplinary three-year NSERC Strategic Project grants for which she was principal investigator. Mentoring and outreach has been a passion of Dr. Staub-French’s since her work as a graduate student, where she created a new mentoring program at Stanford. She has also been a strong advocate for women in engineering since joining UBC, serving as a mentor and Board Member for UBC’s Tri-Mentoring program and participation in numerous outreach activities.